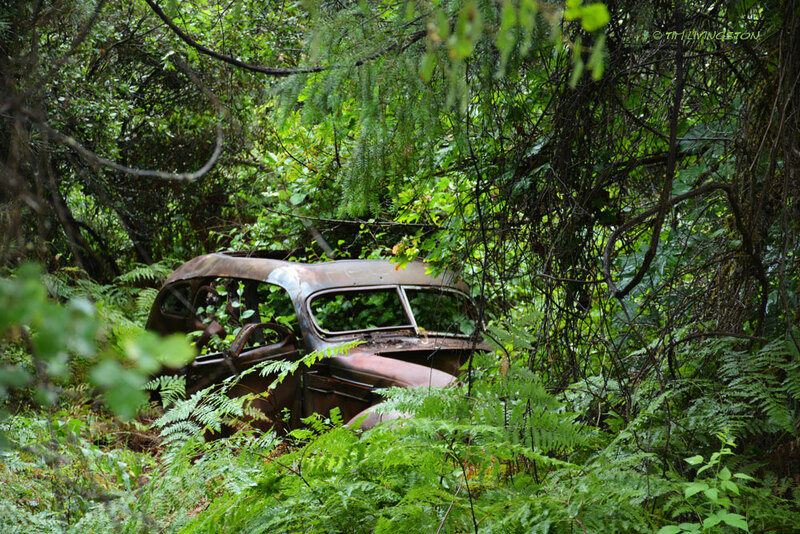 This entry was posted in Art In The Forest And Other Oddities, photography and tagged abandoned car, getaway car, mobsters, photography by foresterartist. Bookmark the permalink. Indeed! I would love to hear it. Some families keep old cars scattered all about their property. I used to especially notice that on hillsides. Looked like yard ornaments. Definitely a story in this one! It’s funny where these old cars turn up. I have pictures of others that I’ve come across. I have to scrape them up. This would be a great photo for a flash fiction story challenge! When I see it I think of two lovers parking! LOL! Great photo! Hah, you see two lovers and I see mobsters, but probably the only ones in the story lately have been bears! You quite right Joy about a story challenge. If someone wants to use this picture for that, they are welcome. Thanks! I appreciate the offer! I may take you up on that for my flash fiction challenge. Please do. I may even contribute. Can you send me the photo to mepricelessjoy@gmail.com? I need for you to put either your name or your blog name on the photo, if you can. My flash fiction challenge is flashfictionforaspiringwriters@wordpress.com. That’s an old, old car. do you know what make/model it was? I don’t know what it is Holly. I didn’t go over a look at it close up. Maybe next time I’m out that way I’ll investigate. Sometimes I do and sometimes I don’t, just depends on if time allows. it certainly is grown over and lost in a thicket-might be hard to get to. No worries, that’s just a normal day around here. Isn’t it great! My first thought was mobsters too … I think it would make a very nice pen and ink drawing Tim! I thought that too Anna! Maybe I’ll try to squeeze it in sometime. I never have a shortage of things to draw. Only a shortage of time. I know the feeling! But I hope you do, you would do a great job of it. I think that one’s been waiting on the getaway for a while……..
And it surely isn’t getting away now.